Debts— you have incurred at least once in your life, right? Be it Even if you just owe a dollar from your friend, it is already considered as a debt. 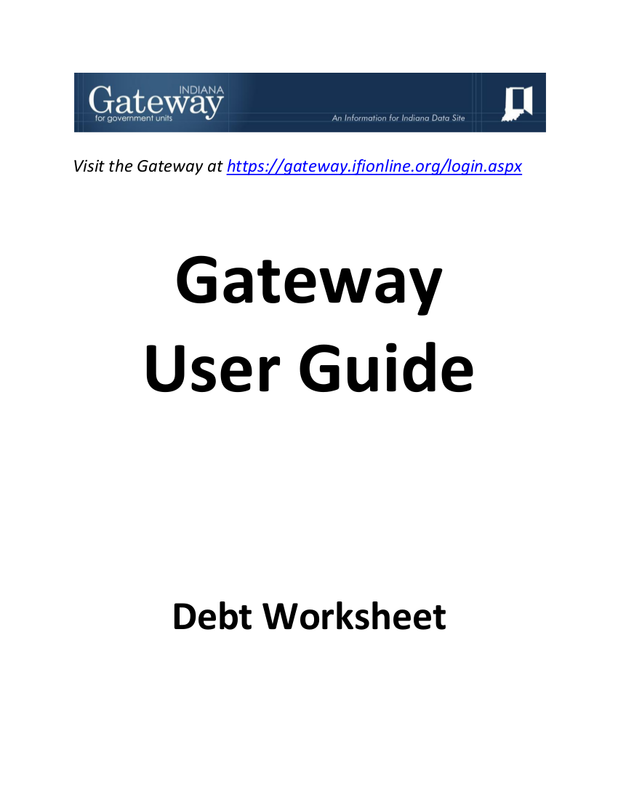 Owing at least one debt feels already overwhelming and stressful, how much more if you owe a lot of debt? You may have sworn to yourself to never have any debts but lo and behold, you just found yourself swimming in an ocean of debts. There are also times when you feel like you’ve missed out some of your debts. This is a result of a poor management. 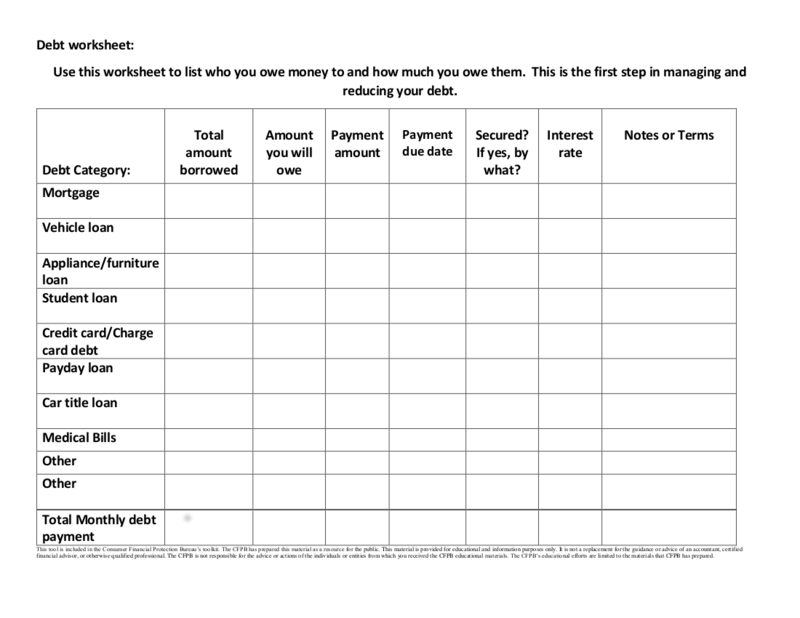 One way to manage all your debts in one place is through debt worksheets. 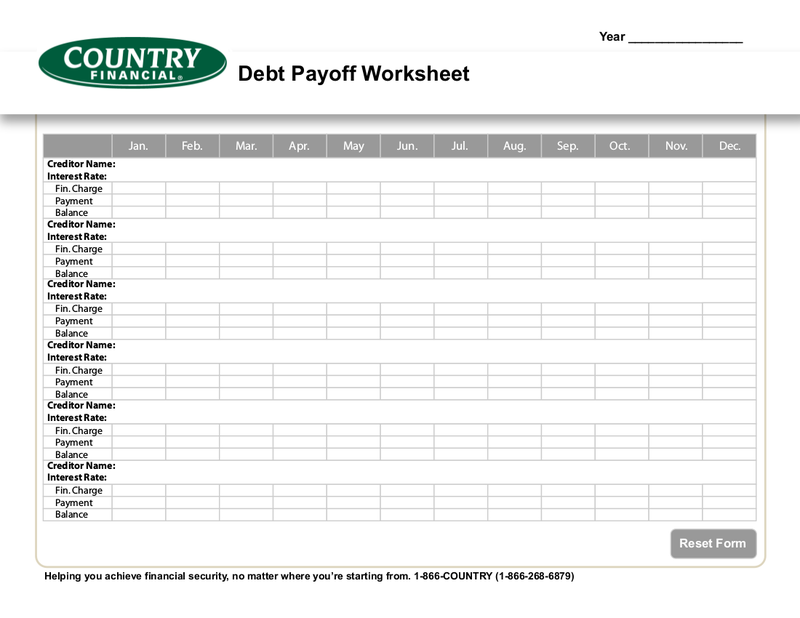 Debt worksheets can help you categorize your debts which make it easier for you to pay. 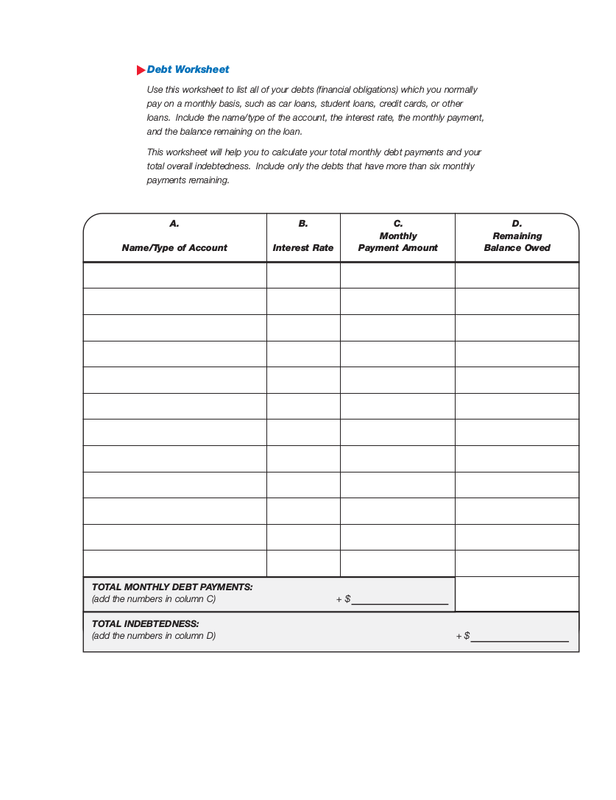 We have provided ten worksheets that will help you in managing all your debts. You may also see Swot Analysis Worksheet Examples. It has been said that for you to be able to understand debt, you have to understand the cycle that is called the debt cycle. The debt cycle begins when you would start to live beyond your means; your means could be the income you get from your job or from the profit of your business. You may also see Time Worksheet Examples. Living and spending beyond your means mean that the total amount of the debt you have incurred is already greater than your net income. Since you have already had yourself accustomed to a lavish lifestyle, you will come to a point that you would already feel like you cannot catch up anymore. When you would already have this kind of feeling, you will borrow more money in order to keep up. Keep in mind that any expenses that are way greater than your income mean that you really have to money in order to maintain your current lifestyle. 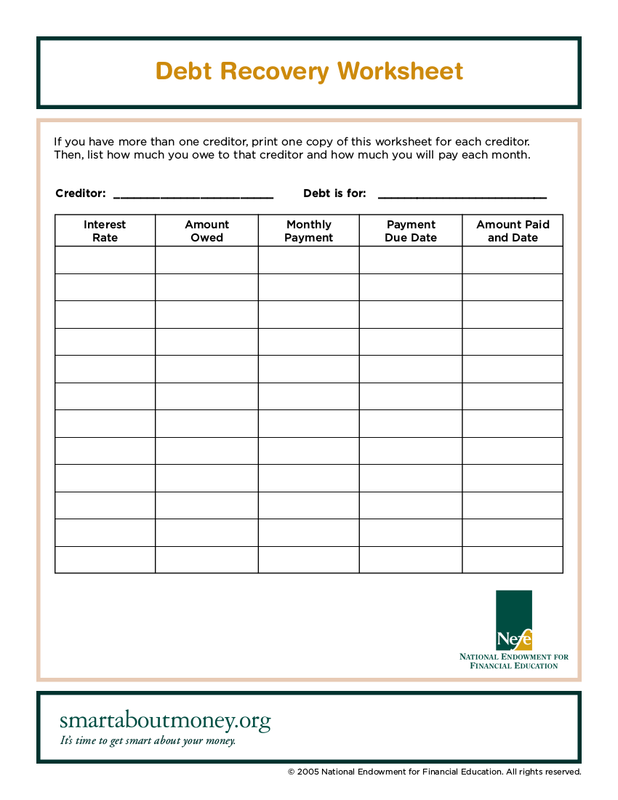 You may also see Self Assesment Worksheet Examples. Then in the middle of this cycle, the truth will finally dawn on you that you have already incurred a lot of debts. You will then decide to pay the least and the easiest amount to pay and then another realization would come crashing upon you: how can you pay when you do not have any savings? You are now getting deeper and deeper in the debt cycle and even the smallest debt will be difficult to pay off. You are lucky if someone would give you money for free to pay all of your debts, you will get an increase in your pay, or that the heavens will rain down money for you. 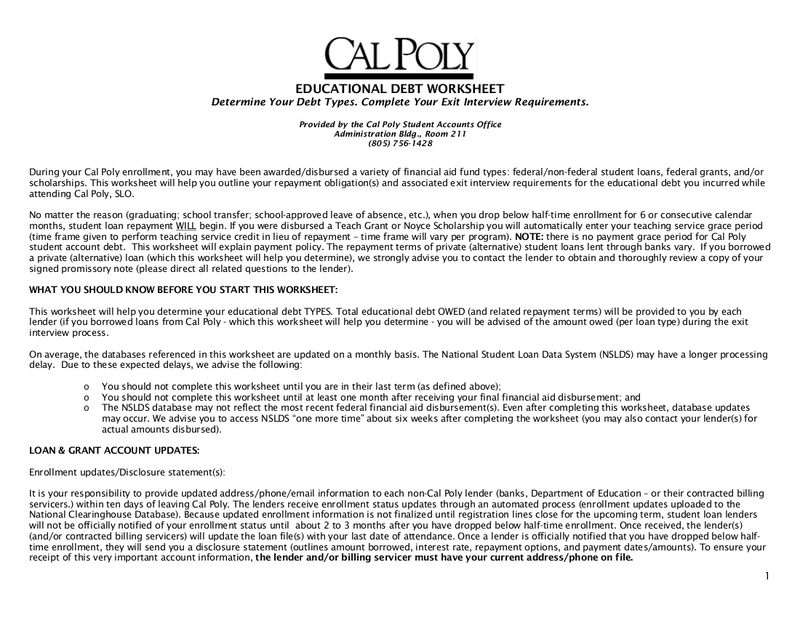 You may also Resume Worksheet Examples. Congratulations on getting yourself out of debt’s grip! But now here’s the challenging part: how to avoid debt when you are no longer under its tight hold when debt is like an open door that you can just enter whenever you want to? Here are twenty ways and tips on how to do so! 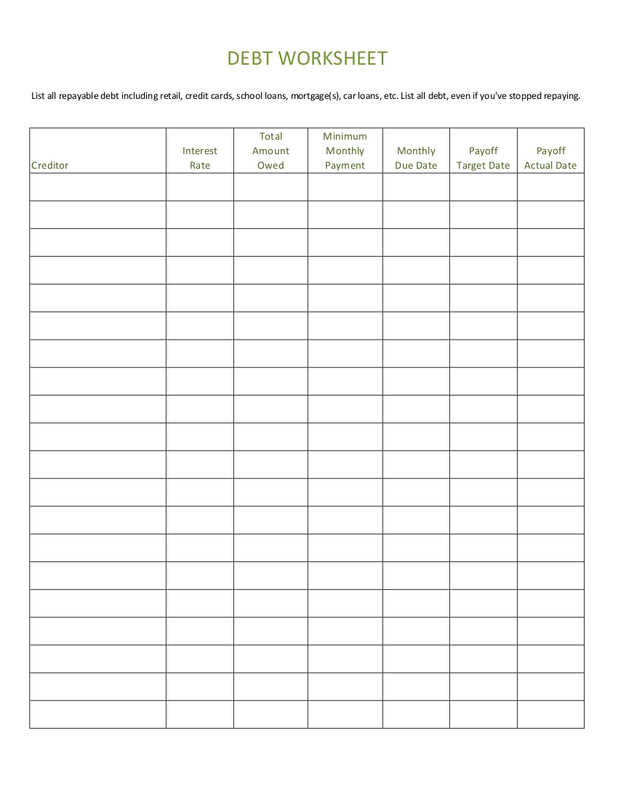 You may also see Interview Worksheet Examples. Have you ever found yourself needing to buy just a couple of things in the grocery store but found yourself going home with a lot of grocery bags? If you do, then it’s time that you definitely should make a list of the things you need before going to the grocery store. This will help you cut back on your impulsive purchases. Take time to sit down and plan out your financial goals and even including your financial struggles. Have someone to talk to while setting your financial goals and who knows? He or she can be your goal buddy and you will have each other’s backs throughout your journey in reaching your life goals. If the people around you have no idea about money and that you have not undergone lessons in school that taught you about managing finances, books, and the internet is your path to salvation. There are a lot of quality resources available at your local library have and reliable internet sites where you can learn about how to manage your finances. You may also see Coaching Worksheet Examples. A good credit score can actually save you on everything. It saves you from interest rates on your loans and credit cards, cable TV subscriptions, cellular phone plans, and your insurance. Maintain your good standing by paying all your bills on time and do not just put it off every time especially if you have money to pay for it. 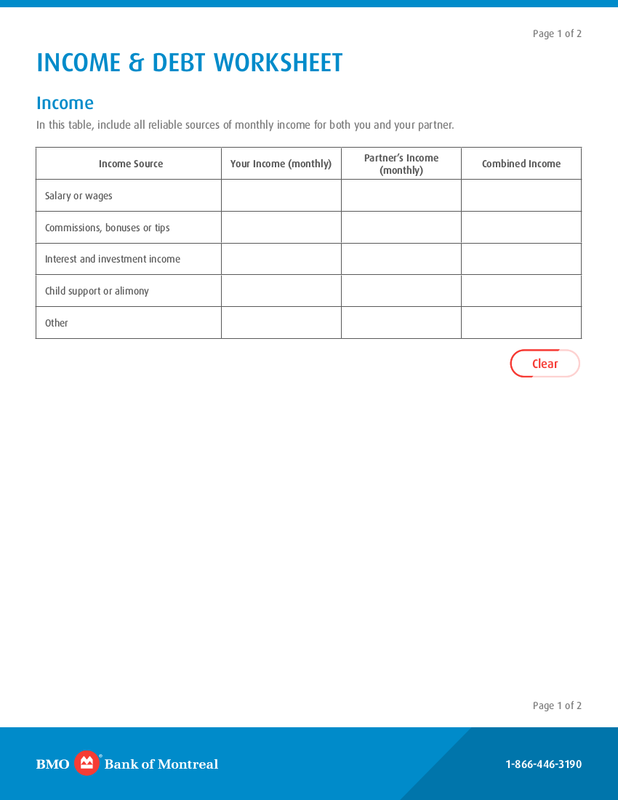 Make use of the technology and your cellular phone and download sample applications that can help you create a daily, weekly, or monthly budget based on your income. Instead of the usual paper that you can easily lose, having your budget on your phone will be a lot easier because you always bring your phone wherever you go and you always make sure you never lose it. These budgeting apps also have an array of options that make your budgeting more convenient. While you can still incur debt even if you just stick to cash, using your credit card will incur more. Just withdraw enough money that you need from the bank and stick to it no matter what and once that money is gone, it’s gone that is why you have to keep a budget for you to stick to the cash you have on hand. Are takeouts taking too much of your time and money? Then cooking your own food can really help you with that. Even if cooking takes so much time, it saves you money. Just precook your meals for your lunch on a Sunday night so you can just quickly cook it in the morning before you head to work. You may also see Alphabet Worksheet Examples. Even if you have enough things, clothes, or shoes, seeing a mall-wide sale poster makes you rethink and think that, well, maybe you ‘need’ more things, clothes, and shoes. If you really want to stay out of debt, do not get fooled by sales and all that discount promotions. When you already have what you need, just put your extra money to your savings account so whenever an unexpected event happens and you need extra cash, just make use of your savings and not borrow money from people or get a loan from the bank. So you have a gym membership but you don’t even go to the gym? Do you also have an online music streaming subscription but you do not even listen to music all the time? How about cancel all those and give your wallet or your bank account a breather? You may also see Sheet Examples in DOC. If the income you receive is just sufficient for you to make ends meet but you do not want to change jobs because you already love your job, then maybe it’s time to take on a side hustle to add more flow of money in your bank account and in your life in general. Know what you are good at and make use of these talents in order for you to make a side hustle. Having poor money management means it’s either you don’t budget or you cannot budget your finances effectively and this would eventually result in your incurring debt. Having a proper and effective budget, you will be able to determine your important and necessary expenses, without it, you will have the tendency to overspend and to spend on things that are not really a necessity. If you also have an expense tracker along with your budget, you will be able to know where your money goes even within the day and that you will see whether you have followed your budget plan or not. Budgeting and tracking your expenses are one of the best ways in order to effectively manage your finances because it is also in this way that you will be able to determine what are the unnecessary expenses that you can cut off in order for you to avoid debts. Have you tried to just window shop at the mall but end up with a lot of shopping bags upon going home? Plus, you even have the audacity to complain having a lot of debts just because of compulsive or impulsive buying when you have brought the situation down to yourself. You may also see Sheet Examples in PDF. Sometimes, you just don’t have self-discipline and control when it comes to your spending. Even if you already have a budget, you will happily disregard it just so you can satiate your compulsive and impulsive self. Ah, the social ladder. You could be desperately wanting to climb the social ladder but the unfortunate thing is that it does not come easy and cheap. You keep on insisting yourselves to be in a group of people even if keeping up with their lifestyle is probably more than what you are earning. You also worry how your family, friends, and even your neighbors will think of you when they see you. And because of that, you borrow money to keep up, with the lifestyle of the rich and famous (even if you are not both) and also to make you look good (and expensive) to the people around you. You may also see Grammar Worksheet Examples. While there are some people who would overspend for their irrelevant wants, there are also some people who would borrow money because they have to survive or at least make ends meet. This happens when they have a lot of important things to spend on, like feeding the family, but their means are simply not enough. If you have reduced income as one of the reasons why you incur debts and that you have already lived in a ridiculously lavish lifestyle, you are definitely in big trouble. If you still cannot accept the fact that your income is not already the same as before, this delayed reaction can negatively affect your life. Once this happens, you must take immediate action such creating a budget that will tailor to your needs and the decreased income that you will be receiving. You may also see Punctuation Worksheet Examples. Gambling is also like the debt cycle; the more you get deeper in its toxic cycle, the more you put yourself and especially your finances in danger. The gambling cycle happens when you lose in a gamble once and then you will then want to gamble again just to win. You said to yourself you will only stop until you win but unfortunately, you did not. So you keep on gambling and gambling while your debt also increases because how else are you even fund your gambling? Through credit cards of course and nothing can spell ‘debt’ better than credit cards. Savings are important in order to combat unwanted debts. But what if you have insufficient savings because you don’t really save a lot at all? You are in big trouble. Sufficient savings can totally keep you from resorting to accessing, short-term, and high-interest credit just to meet the unexpected bills that would occur. 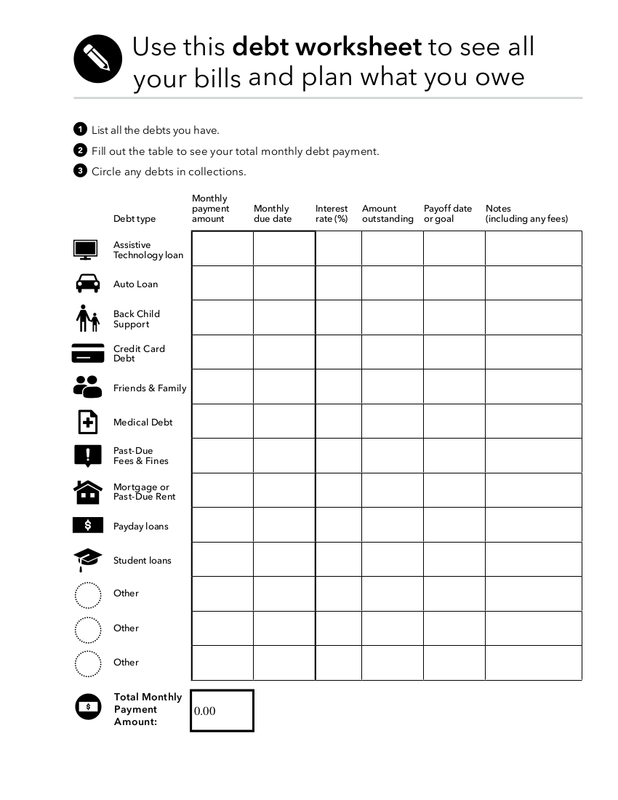 If you would have a budget, to begin with you will be able to have a percentage of your income to go to your savings so whenever an unexpected event would happen, you have some funds that can either decrease the amount you are to borrow or to entirely pay off unexpected expenses without incurring debts. 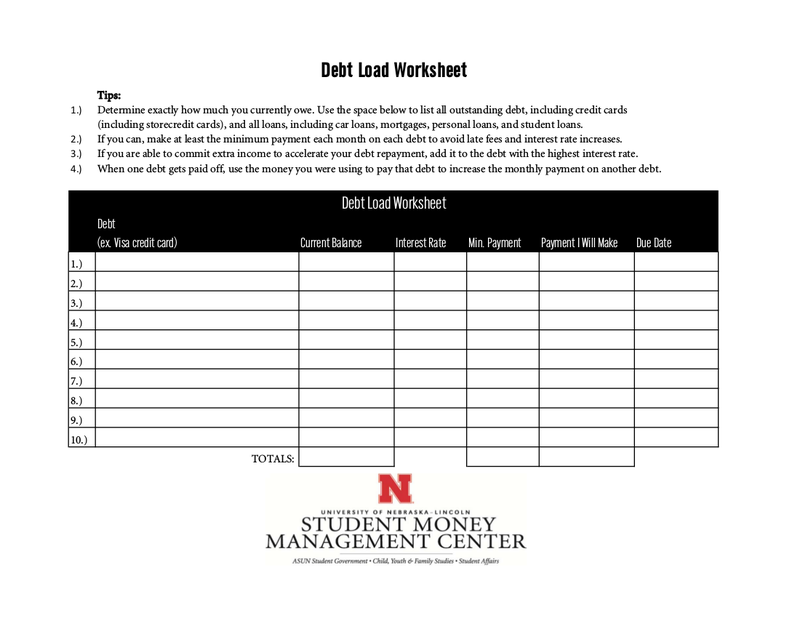 We hope that you have gained insights related to debt with the help of this article and the newspaper worksheets have helped you manage or track all the debts you have to pay off.